Every satisfied patient of yours should bring you more patients, right? The ideal is for word-of-mouth to do all the work—for your happy patients to refer their friends and family to you, who in turn become patients. But what if you’re not quite at that stage? No internal referral system that is set up, no follow up with existing patients that get’s them to pay, stay and refer. That’s when the next-best thing needs to happen: for every happy patient to influence potential patients. More specifically, short of having your patients actually deliver more patients to your door, the best thing is for your current patients to sway potential ones by writing great reviews of your business. You work your tail off to do a super job. Sure, that’s its own reward, because you get paid and your patients get what they wanted. Everybody’s happy. But is that the only reward you get? Or do you also get at least a little public recognition for every great job you and your staff do? Without online reviews, it’s harder for people to conclude that they should pick you over your competitors. 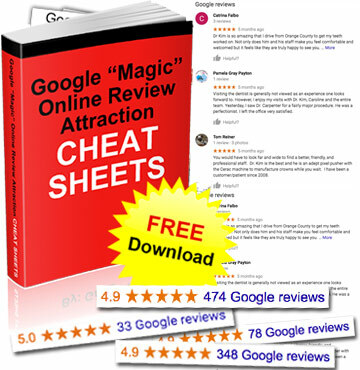 Plus without reviews you’re far less likely to outrank your competitors in Google. The bottom line is you need to ask each and every happy patient for a online review. But how? This is where even the smartest business owners—the ones who know how important online reviews are to potential patients—often get stuck. They’re not sure how to ask patients or how to show them what to do, so the reviews simply never happen. Fortunately, you’ve got options. 13 of them. It doesn’t matter how much time you have, or how many customers you have, or how computer-savvy they are. At least some of these methods will work for you. Organic method—making sure your business is listed properly on Google (98% of dentists are NOT), so that customers can find you if they feel like writing reviews spontaneously. Links or clickable images on your site—something that patients who return to your site can click on to write you reviews. Single-page handouts—a sheet of instructions you can simply hand to customers, which walks them through how to post a review. Personal email—a simple email with a polite request and a link. But for Pete’s sake, personalize it: none of that “Dear Valued Customer” garbage. You can also do this with your email signature: instead of a bunch of fluff at the bottom of your emails, have a little link to where customers can dash off a quick review. Snail-mail request/instructions—people generally pay more attention to snail-mail, especially if it’s personalized and from a business they know and like. This method is more work, but you’ll probably bat pretty well if you do it. Video—a short walk-through, for patients who you think would just rather watch a quick video than follow other types of easy instructions. Social media—in particular, Facebook. What’s nice is customers can write reviews directly from a social media post or campaign. QR code on a postcard—hand or send your customers a little postcard that asks them to review you by scanning a QR code with their smartphones. The QR code would just contain a link to your Google Places page. QR code as a sticker or decal—the sticker or decal could go anywhere in your office or store, and customers could scan it with their smartphones to review you on the spot. Phone call—kinda old-fashioned, but effective with the right kind of customer. Part of a little gift that you send patients. Like a free pad of paper with your logo and phone number on it, plus a request to leave you a quick review. Or a fridge magnet. A pen might be a little too small. The gift has to be something people will actually use, keep on their desk or kitchen table, and see every day. The idea is it’s a subtle but persistent reminder. “The People Method” In other words, talk to your patients in the office and ask if they would like to write a review. Instead of the patient watching your TV or looking at their own phone, spend the time talking about what they like (or don’t) and show them your QR code to review you online. I suggest you only do this with really close, really loyal customers who don’t mind helping spread the good word. These methods are NOT mutually exclusive, nor do you have to pick one or even just a few. You can use as many of them as you’d like. In fact, it’s best if you use a variety of them, so you get reviews on a variety of sites, and so you can determine over time what works best for you and your customers. It will help you achieve More phone calls.. More New Patients. More Profit! Be Bold! Make Things Happen! Please leave a comment or question below. Love to hear from you! Category Local Search Tips, Marketing & Growth, Practice Management | Bookmark the permalink. ← Evolve Or Die: Is Your Dental Practice The Next Kmart or Amazon?